Traditionally Orthopaedic Special tests were used to assist in the diagnostic process by implicating specific tissue structures that are either dysfunctional, pathological, or lack structural integrity, confirming the findings from the physical assessment and providing a tentative diagnosis. Special testing is generally performed following a full examination of the shoulder that includes but is not limited to patient history, mechanism of injury, clinical observation, bony and soft tissue palpation, assessment of active and passive physiological movements, assessment of passive arthokinematic / accessory joint mobility, neurological assessment, manual muscle testing, and functional assessments. Reproduction of pain, and weakness during these special test were considered clinically diagnostic. 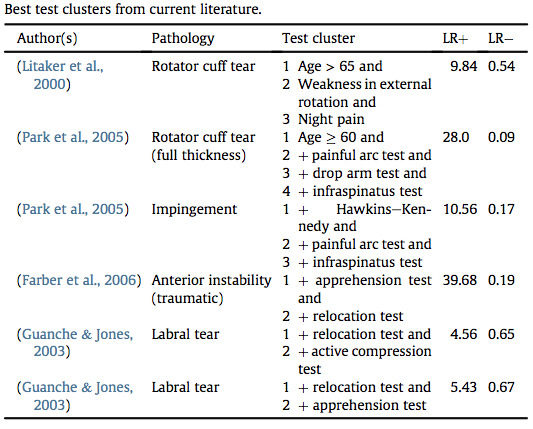 According to Magee  many of these special tests, in particular those involving the labrum, have not shown high sensitivity or specificity; and as a result combination of tests or test clusters, often referred to as clinical prediction rules are considered more useful, although even in these cases, the tests are not necessarily definitive. While there has been a large amount of research on Orthopaedic Special Tests for the shoulder, according to Hegedus et al  much of it is of low to moderate quality  and where they are high quality they display limited solid diagnostic metrics, sensitivity or specificity or application to clinical practice and as such are likely to vary greatly in the hands of different clinicians and in varying clinical practice environments. Similarly, while clustering Orthopaedic Special Tests together has been shown to improve diagnostic accuracy in both research and clinical practice, in many cases these clusters are being used incorrectly.Hegedus et al  identified just 6 best clusters, with best defined as those combinations of tests with the strongest likelihood ratios from research with the highest quality, judged through use of the Quality Assessment of Diagnostic Accuracy Studies (QUADAS) document with a score of > 10. They suggest that any studies whose QUADAS is 10 or less have many design faults which make the likelihood ratios questionable and probably only applicable to those specific populations examined in the study, and not repeatable in outside of that group. The following table summarises the current best clusters based on current evidence. So what we do now know about Orthopaedic Special Tests of the Shoulder is that these tests generally cannot be utilised to make a definitive structural or pathoanatomic diagnosis, they may help us with symptom reproduction which can be used to test and retest following therapeutic interventions to assess for any change in symptoms. You can find the range of Individual Orthopaedic Special Tests for the Shoulder below. ↑ 2.0 2.1 Biederwolf NE. A proposed evidence-based shoulder special testing examination algorithm: clinical utility based on a systematic review of the literature. International Journal of Sports Physical Therapy. 2013 Aug;8(4):427. ↑ Lewis J, McCreesh K, Roy JS, Ginn K. Rotator cuff tendinopathy: navigating the diagnosis-management conundrum. journal of orthopaedic & sports physical therapy. 2015 Nov;45(11):923-37. ↑ Lewis JS, Tennent TD. How Effective are our Diagnostic Tests for Rotator Cuff Pathology. Evidence Based Sports Medicine. 2nd Edition. BMJ Books. Blackwell Publishing. 2007. ↑ 5.0 5.1 5.2 5.3 5.4 Hegedus EJ, Cook C, Lewis J, Wright A, Park JY. Combining orthopedic special tests to improve diagnosis of shoulder pathology. Physical Therapy in Sport. 2015 May 31;16(2):87-92. ↑ 6.0 6.1 6.2 Hegedus, E. J., Goode, A., Campbell, S., Morin, A., Tamaddoni, M., Moorman, C. T., 3rd, et al. (2008). Physical examination tests of the shoulder: a systematic review with meta-analysis of individual tests. British Journal of Sports Medicine, 42, 80e92. discussion 92. ↑ 7.0 7.1 7.2 Hegedus, E. J., Goode, A. P., Cook, C. E., Michener, L., Myer, C. A., Myer, D. M., et al. (2012). Which physical examination tests provide clinicians with the most value when examining the shoulder? Update of a systematic review with meta- analysis of individual tests. British Journal of Sports Medicine, 46, 964e978. Pages in category "Shoulder Special Tests"